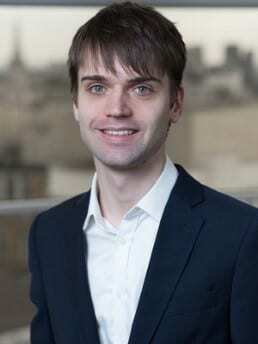 Matej Macak studied Psychology for his undergraduate degree and Neuroscience for his Masters and doctoral studies. He tells us what it’s like being Management Consultant at McKinsey & Company. I work as a management consultant for McKinsey & Company. My work is to help companies to improve their performance which can take many different forms, from helping CEOs design new business strategies to working on the factory floor helping to improve one process at a time. Typically, the work I do for a client is very short by PhD standards, generally up to three months. Every project is unique and brings new challenges and problems to solve. I studied Psychology for my undergraduate degree followed by Neuroscience for my Masters and doctoral studies. I love my subject and I find the human brain to be an incredible challenge. Up until now, I enjoy learning about the latest research and I have stayed in touch with my colleagues. At the end of my PhD, I wanted to work on something that I could feel had a tangible impact in shorter time frames. The very first project that I worked on actually drew on my knowledge in Psychology to help devise new strategies for bank clients to control their spending and save money. As that project drew to a close, I could see the results of my team’s work presented in the news. One year on, I have a few such examples of real change I contributed to during several client engagements and look forward to new challenges each project brings. Each project is different and so there is no such thing as a “typical” day. As a management consultant, I am often asked to solve problems that my clients struggle with despite of years of experience in their industry. That means unexpected challenges, tough puzzles and new problems to face every day. The job can take forms ranging from organising a workshop with senior clients to undertaking quantitative analysis of financial performance to devising a strategy for introducing a new tech product to the market. The work is different every day but always interesting. I use skills developed during my PhD every day. During my PhD I improved my ability to break down complex problems, to analyse and interpret large data sources and to present my findings in a structured way. These skills are incredibly useful in the daily life of a consultant and I feel I have been drawing on them during every project so far. I love the feeling that I am changing the way how people work almost every day. It can be very fulfilling to see the real impact of “my” consultancy project for our client. The learning curve has been quite steep – I face new problems, industries and different client interactions on each study. Coming up with solutions as a part of a team is exciting, collaborative and rewarding at the same time. People I work with are warm, intelligent and supportive. One year on, I feel like my work has had a real impact and I have formed many friendships in the process as well. The work is challenging and sometimes a bit of a roller coaster, fast paced with tight deadlines. However, looking back, I can see that the most difficult problems often spark ideas we become the most proud of. Consulting is a career that is highly rewarding and I would recommend it to anyone who likes to solve problems in a collaborative environment. I think that the best insight into consulting comes from simply speaking to consultants – friends or employees at career fairs. Whilst interest in business and strategy are useful, do not underestimate how much you will learn on the job and how steep the learning curve will be. Talk with the consultants about their experience and industry and see if the problems they face would fit well with your interests and goals. 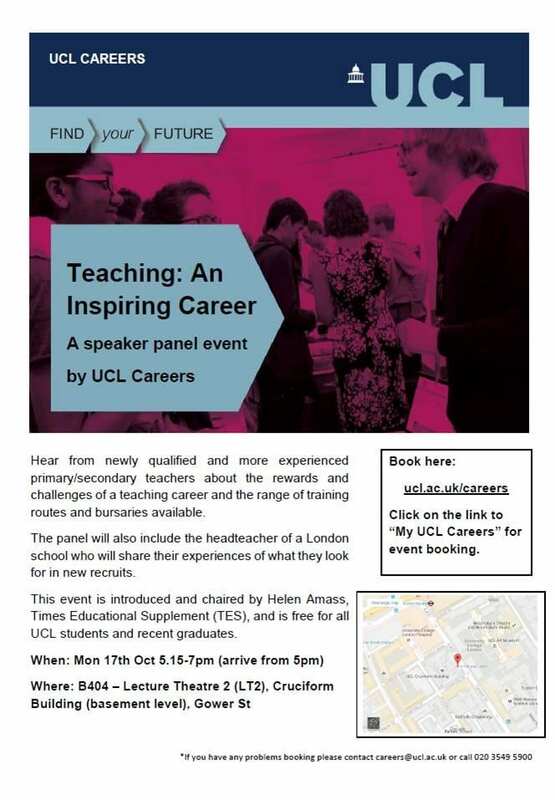 This is an event for all UCL students who are interested in the teaching profession. The event will be introduced by Helen Amass of TES (Times Education Supplement) who will give an overview of the current state of the industry. Helen will then chair a panel discussion. The panel speakers, who are all teachers, most newly qualified, will share their experiences of the profession – the highlights, the challenges, and how it differs from their preconceptions. We will also hear from a headteacher about what they look for in new recruits. The panel members will then take time to answer your questions. As well as hearing personal stories and real-life experiences of teaching in different types of schools, including primary and secondary, and both state and private education, you’ll have a chance to hear about the various routes into teaching, including PGCE, Schools Direct and Teach First, before UCAS opens for applications (courses will be available to search on their website from 11th October, with applications potentially opening the day after this speaker panel event).